ibis Styles Singapore is strategically located at 401 Macpherson Road, and complemented by the new Macpherson Mall as part of the hotel complex (opening soon). Ideal for family vacations, the stylish and colorful hotel has a sleek cruise ship-like exterior, 298 rooms, and special design furniture for the guests' comfort. 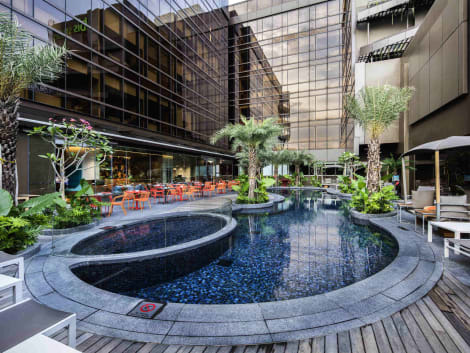 The hotel offers complimentary WiFi, and free shuttle service to the nearest MRT station, Chinatown and Orchard Road vicinity. Make yourself at home in one of the 69 air-conditioned rooms featuring free minibar items and LCD televisions. Complimentary wireless Internet access is available to keep you connected. Bathrooms have complimentary toiletries and bidets. Conveniences include laptop-compatible safes and complimentary bottled water, and housekeeping is provided daily. Make yourself at home in one of the 451 air-conditioned rooms featuring minibars and LCD televisions. Complimentary wireless Internet access keeps you connected, and cable programming is available for your entertainment. Private bathrooms with showers feature complimentary toiletries and hair dryers. Conveniences include phones, as well as safes and desks. Located in Singapore (Kampong Glam), Hotel Boss is within a 10-minute walk of Sultan Mosque and Haji Lane. 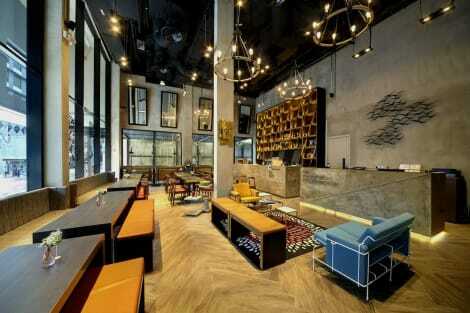 This hotel is 0.5 mi (0.8 km) from Bugis Street Shopping District and 0.5 mi (0.9 km) from Mustafa Centre.